Richard Innes Peek was born on July 30 1914 at West Tamworth, NSW, and entered the Royal Australian Naval College in 1928, where he passed out with top marks. He completed his initial training with the Royal Navy in 1934-35, when he was awarded five first-class certificates in his Sub Lieutenant exams: in seamanship, academic subjects, gunnery, torpedo and navigation. He then served in the Australian heavy cruiser HMAS Canberra and the British battleship HMS Royal Sovereign before specialising in gunnery; at the outbreak of war he was serving in the battleship HMS Revenge. In 1941 Peek returned to Australia to join the light cruiser HMAS Hobart as gunnery officer, and saw action in the Mediterranean and the Far East. At the Battle of Leyte Gulf he was on the bridge of HMAS Australia, standing near the Captain, Captain Emile Dechaineux RAN, when a kamikaze aircraft struck the ship. Dechaineux and 30 men were killed, and 56 were wounded, including Peek, who suffered burns. For his skill and courage in helping to save the ship from further damage he was appointed OBE. He was also awarded the Distinguished Service Cross for skill and devotion to duty during an earlier amphibious assault at Lingayen Gulf. Peek led the RAN contingent in the victory celebrations in London in 1945, and remained in England to complete a staff course before becoming Commander, 1st Frigate Squadron in the River class frigate HMAS Shoalhaven in 1951. During the Korean War, while in command of the destroyer HMAS Tobruk, he was awarded the US Legion of Merit. He was Deputy Chief of Naval Personnel in 1954, and took command of Tobruk again from 1956 to 1958 as Captain, 10th Destroyer Squadron. Four years later he commanded the aircraft carrier HMAS Sydney, and subsequently the Australian flagship HMAS Melbourne. In 1964 he was promoted Rear Admiral and was appointed Fourth Naval Member and Chief of Supply of the Australian Commonwealth Naval Board. From 1965-67 he Deputy Chief of Naval Staff. He was then Flag Officer Commanding Australian Fleet in 1967, before becoming Chief of Naval Personnel in 1968. 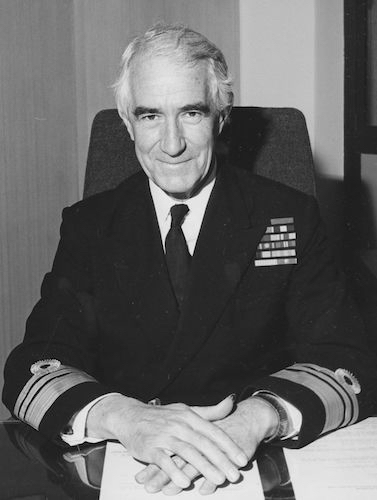 In November 1970 Peek was promoted to Vice Admiral and appointed Chief of Naval Staff. Peek was appointed CB in 1971, and knighted in 1972. In 1973 Peek retired to take up farming, but continued his involvement in Australia's naval defence. He provided expert advice to parliament as recently as the 2009 White Paper discussion process and was a tireless advocate for naval veterans of all campaigns. Vice Admiral Sir Richard Peek passed away on 28 August 2010. He is survived by a son and two daughters.